Hello! I have returned from a delightful trip home to Alaska, so it’s back to normal life for me. Well, technically I’m still on the way back to Montana, but close enough. With my second half marathon now behind me, next on the agenda is to find a third. I have three penciled in for fall, but that leaves the sixth up for grabs. Looking at one around here on July 26, but I haven’t signed up yet. 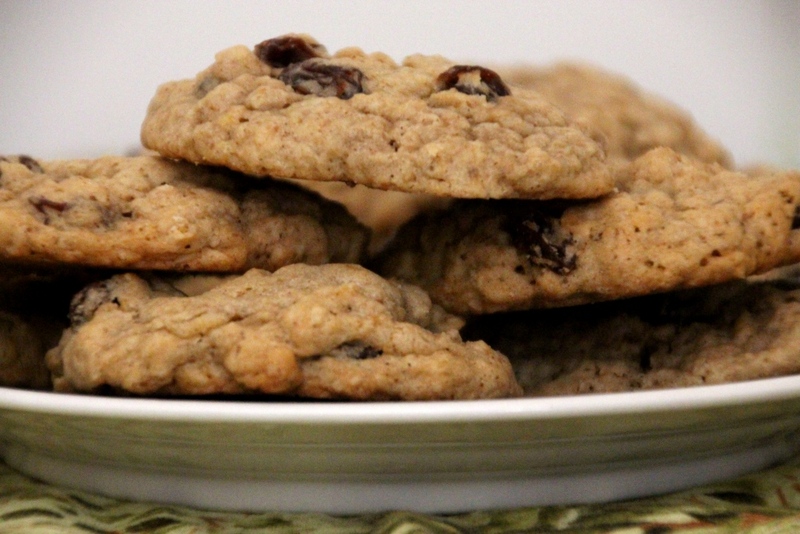 In any case, today I bring you another classic: oatmeal raisin cookies. I love this recipe because it always turns out soft and chewy, which is how I think cookies should be. (Shortbread, Thin Mints and Oreos are notable exceptions.) 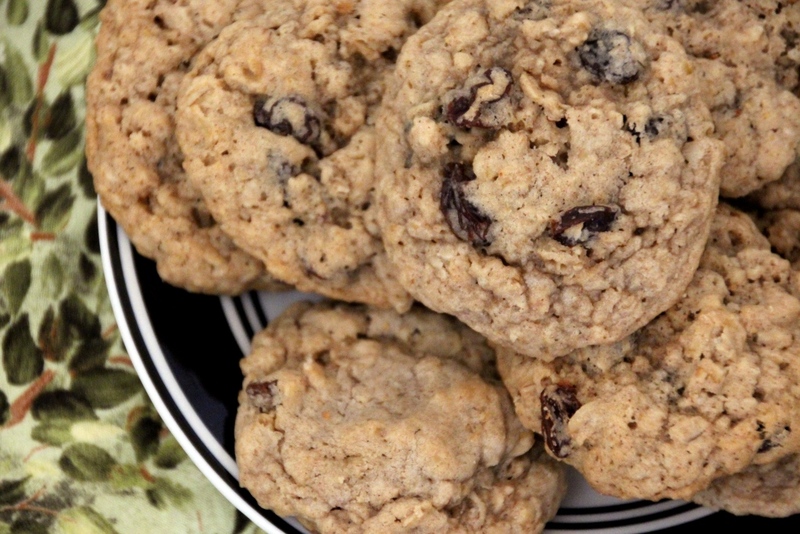 It is your standard cinnamon and raisin flavor with the chewy oatmeal base. I sometimes add a cup of chocolate chips, but this time I left them out. Considering it’s such a classic flavor, I don’t think these cookies need much talking up. 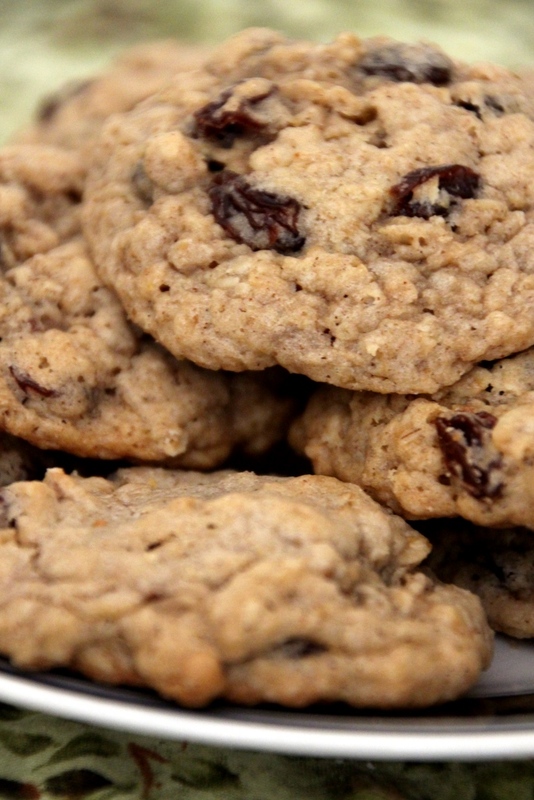 They are soft with just the right hint of cinnamon and a smattering of raisins throughout. Be careful not to over-bake them, as they get crunchy very quickly. Unless you’re in to that sort of thing, in which case you’re just confusing me. Preheat oven to 350 degrees Fahrenheit; line cookie sheets with parchment paper or silicon mats. Using an electric mixer, beat butter and both sugars until light and fluffy. Meanwhile, in a small bowl, mix together first group of dry ingredients. Add in flour mixture, beating until well combined. Stir in oats and raisins (and chocolate chips) until completely combined. Roll 2 Tbsp of dough into balls and place on a cookie sheet. Bake 9-11 minutes or until cookies are matte on top (they will look under-done). Cool for a few minutes on the pan, then remove to a wire rack to cool completely. Store in an air-tight container on the counter for up to a week.